Did I mention I was a rather large thirty-seven year old child? Well in those years I have become a rather avid Remote Control Car Racer, F1 cars of course! Strangely and unexpectedly late in 2007 I took a trip to this co-workers house to check out his "slot-car" track. I use those quotes sarcastically at that time. I was completely pessimistic and was used to the full control one gets at the hands of a RC car. Throttle, braking and steering to mention a few. Skill most importantly and I thought slot cars were anything but. 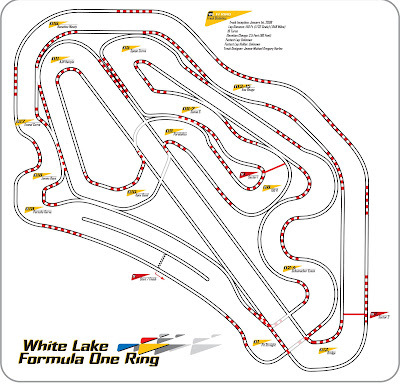 Enter DBR and his magnificent Legends International Raceway of which you can see more at AC2car.com. No pictures handy to support this, but I encourage you to check out the site and see for yourself. I was utterly in awe. 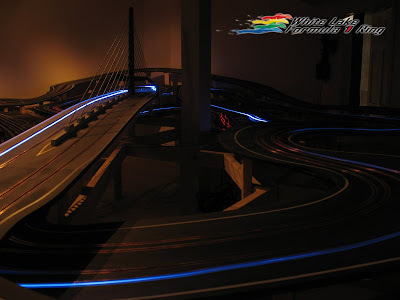 Not only was there this race track in front of me, but it was beautiful in the scale model sense. It was a thrill to drive and most importantly it was a challenge to race on. I was instantly hooked. I quickly had visions of a designers creation mixed with a passion for racing. Maybe most importantly I have gained a good friend, someone I can share this insane hobby with. My thanks DBR. -My love to my lady, my number Eleven, for the encouragement to share this creation with others that might share my passion.